Hogue is perhaps one of the best-kept secrets in the production knife industry. After spending a few weeks with the outlandish Hogue EX-04, it becomes harder to understand why they aren’t more of a household name. Let’s take a closer look at this beast of a blade. Hogue Inc. doesn’t have their roots in the cutlery industry – Hogue Knives is actually an offshoot of their primary business, which is making firearm accessories. Guy Hogue, a former police officer, started the brand in 1968. They’ve made a name for themselves with high-quality and attractive grips, stocks, holsters, and other finely machined products. When they decided to go into knife making, they made two wise choices: they were going to do it themselves, and they were going to go big for bringing in design talent. The first is important. If you look at most knives from the major gun brands , you’ll notice a pattern: they’re all crap. Smith & Wesson, Browning, Winchester, Colt, Remington – no thanks. H&K and Ruger get a pass as they’re made by respectable brands (Benchmade and CRKT, respectively) – but Hogue insisted on making their knives in a US facility, and the quality of the knives is just as impeccable as their gun grips. The second part is important too, because no one wants a well-made but ugly and poorly thought out amateur hour blade. So they brought in none other than Allen Elishewitz, who should need no introduction to readers of this site. He’s done collaborations with Benchmade and CRKT, and his custom knives go for close to or over a thousand dollars. He’s the lead designer for Hogue’s entire line of knives, and his aesthetic is visible throughout. Hogue has four lines of folding knives – the EX-01, a sort of “normal” 3.5 or 4” folder, the EX-02, a flipper framelock, the EX-03 which has a lightweight poly handle, and the EX-04, the target of our review here. The EX-04 actually comes in a total of 16 variants, with a choice of 3.5” or 4” blades, modified wharncliffe or upswept blade styles, and multiple different colored handles. They all feature a black-coated blade and a button lock. The version we test is version #34449 the 4” modified wharncliffe blade with black and gray two-tone “G-Mascus” handle. I would say that the blade is the most controversial part of the EX-04, but really the whole thing is. I’m an open-minded guy, but I’m just not a fan of recurves and compound/complex grinds. Or coated blades for that matter. The EX-04 has all of these. The blade shape is a “modified wharncliffe” – sort of a wharncliffe with part of the front chopped off. The cutting edge itself has a fat belly followed by a recurve as you approach the tang. More interestingly, the grind itself is compound – from Hogue itself, “Both the conventional upswept and modified Wharncliffe blades have dual grinds producing a striking style that holds a keen edge for ease of cutting.” Interesting in theory, but in practice a hollow grind or a full flat grind gives you less friction travelling through materials, an issue that’s compounded by the gritty black coating on the blade. The spine is cut from thick stock, 0.15”, and has two separate curves ground into the top, the closest to the pivot serving as an effective thumb ramp. 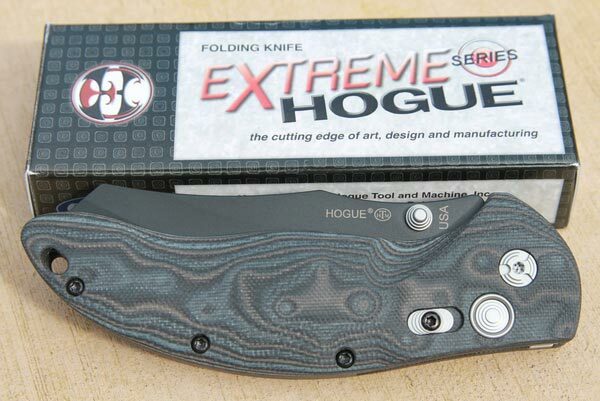 While I may not be in love with the grind on the EX-04, there’s no arguing with the edge Hogue puts on this knife from the factory. It’s among the sharpest, cleanest factory edges I’ve seen on a production knife – the other being the Gayle Bradley Folder – an accomplishment considering the complexity of the grind. The blade is made out of Crucible’s 154CM, no longer a top-tier steel by today’s standards but a decent stainless steel that’s done yeoman duty at Benchmade for years. I have absolutely no problems with 154CM – edge retention is decent, it gets wickedly sharp, and touching up isn’t bad at all. A great example of an affordable steel that balances retention with sharpening ease and corrosion resistance. All good here. The handle is made out of what Hogue calls “G-Mascus,” which is colored layers of G-10 to create a material that looks vaguely like Damascus. They’re steeply contoured and the organic shape of the EX-04’s handle fills the hand quite naturally. The texture isn’t quite Cold-Steel rough (read: “destroy your Levi’s rough”) but there’s enough to give you a good grip on the knife with wet or dirty hands. Like pretty much any knife I review, I have to dock points for there not being a forward finger choil of any sort. With this much blade real estate, surely there was room to include one. There’s also not any thumb ramp on the spine of the blade, so getting a “forward grip” on the EX-04 isn’t really practical. It’s a feature I’ve come to appreciate on a lot of my Spyderco knives, along with simpler products like the Cold Steel American Lawman. Ahh, an area where the EX-04 really shines! 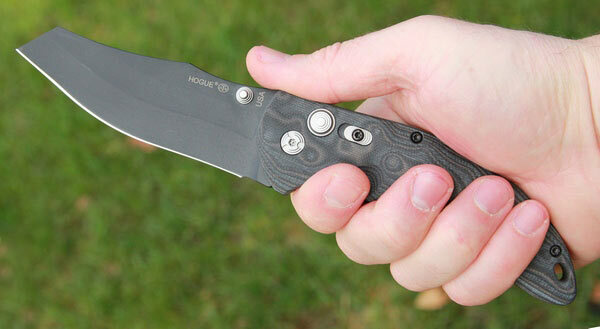 All of the folding Hogue knives (except the EX-02) use a button lock, also referred to as a “plunge lock” in some circles. Button locks are normally used in automatic knives, but even in a manual application the button lock shines if done right. The lock springs open when the blade is fully extended, fitting into a cutout on the tang of the blade and holding it into place. To release, you press the button in and swing the blade shut. There is a cutout on the opposite side of the tang that the button lock rests in to keep the blade shut as well. As to be expected of a mechanism with this many moving parts, the EX-04 requires some break-in but became silky smooth after a few days of use. Initially the detent was way too hard but that gave way after flicking the knife open for a few days. The knife opens very well with a thumb flick, and there’s a satisfying “thwack” noise when it locks in place. In my time testing the knife, no pivot adjustments have been needed and the blade exhibits no horizontal or vertical blade play at all when open, impressive for a rather heavy 4” blade! Of note: the EX-04 doesn’t actually have pivot washers at all, so the blade turns against stainless metal plates embedded in the handles. This is one of the things about the EX-04 that make me scratch my head. It required a good amount of oil worked into the pivot to get the action smooth, but it’s stayed that way for a few weeks now. I do wonder about wear on both the surfaces of the blade and the slip plates in the handle, though. Time will tell if this becomes an issue or merely idle speculation. If it works, no reason to complain! Exemplary. The Hogue EX-04 is one of the best put together, best detailed, best built production knives I’ve come across, on par with Taichung Spyderco’s, and a step above the vast majority of Benchmade knives. As I mentioned earlier, the quality of the complex edge grind is perfect. All of the moving parts in the button lock seem to be machined perfectly, with little to no friction in operation after breaking in. That huge blade is still sitting perfectly centered in the handle when closed, too. The joint on the spine between the two halves of the handle could be smoother, but I’m nitpicking at this point. Feature wise, things get interesting. One of the biggest demerits to the EX-04 is the clip: the only available position is right-hand tip down. I don’t generally carry tip down, and while I can get used to it, the fact is that it’s another step between pulling the knife out and having it open. I suppose I can understand the exclusion of the left-side clip holes since the button lock is probably difficult to operate left-handed, but the lack of a tip-up carry option is a big detriment for me. The clip itself is rather short and flares out like a spoon at the end. While it’s odd looking, it does seem to slide in and out of a pocket smoothly and holds securely. In addition to the button lock, the knife has a safety switch that prevents the lock from releasing with the blade in the open position by blocking part of the button from retracting. I’ve never been convinced of the merits of secondary safety devices on folding knives (such as CRKT’s obnoxious Auto-LAWKS system), so this one does the best thing it could do: it doesn’t get in your way. I’ve tried the switch out and can confirm it works, but much like the “manual shifter gate” in an automatic transmission family sedan, it’s a toy that you’ll play with a few times and then never use again because it’s pointless. The problem with the EX-04, as I’ve said before, isn’t the lack of a good clean edge. It’s the geometry of the steel and the grabby black coating on the surface. The EX04 passes standard tests of sharpness with ease – will it shave hair off your arm? Can it smoothly push cut through catalog paper? Absolutely! When it comes to everyday real tasks you do with a knife, it’s not so clear cut. Breaking down cardboard (arguably one of the most common pocket-knife tasks) is a bit more of a chore with the EX-04 than with most other knives in my collection, which lean more towards utilitarian than showy. 154CM is a nice balance between hardness and sharpening ease, and it’s not much of a chore to clean the edge up on the blade despite the funky grind. Of course you do have to exercise great care to not mark up the blade coating when you’re sharpening. It’s hard to identify alternatives to such an unusual, niche blade, but let’s take a look at heavy-use folders in the 3.5-4” range. The ZT 0909 by Les George is a return to form for ZT: big, heavy, overbuilt, bold, and exquisitely crafted. With a sculpted G10 handle, a big 3.875” CPM S35VN blade, flipper opening and a beefy liner lock, the 0909 is a no-nonsense huge hard use folder for $180 retail. Gotta love the 3/8” hex head pivot adjustment! The ZT 0804CF by Todd Rexford is another choice, offering a 3.875” black-coated drop point blade in ultra-premium CTS-204p steel (similar to 20CV and M390) on a ball bearing pivot for $280. If you want another big chunk of unusual knife with a smooth lock, the Benchmade Contego is worth a look. The 3.98” blade is made from CPM-M4, the same fantastic steel as is found in the Spyderco Gayle Bradley Folder, and here the black coating at least serves an anti-corrosion purpose. The aggressively textured G10 handle gives the Contego a distinct look, and Benchmade’s Axis Lock needs no introduction for its smooth operation and solid lockup. A good deal at $182 retail. If you like the Hogue build quality and slick button lock but want something a bit more… conventional, the mainstay of the Hogue line – the Hogue EX-01 – is offered in a variety of handle materials and blade lengths and shapes. Here, the 4” drop point blade has a single grind and is stonewashed instead of coated, and the G-Mascus handle is a little more conventionally shaped. Still no forward choil, but at about $200 retail you’re still about $20 cheaper than the EX-04 as tested, or if you prefer a smaller blade the 3.5” drop point retails for about $185. There are a lot to like about the Hogue EX-04, and a few things to dislike. It’s an exceptionally well-built knife, with top notch fit and finish on par with the likes of Al Mar or Pro-Tech. The button lock is immaculately executed, it comes with a scary sharp edge from the factory, the G-Mascus handle is a thing of beauty (your mileage may vary) and it’s designed by one of the industry’s best-known names. Let’s also not forget that it’s made in the USA – which has to be worth something. However, for my personal tastes, the unconventional aesthetics and grind of the EX-04’s blade gets in the way of every day usability, which is what I place the greatest emphasis on when it comes to daily carry knives. If it were my money, I’d look to add a 3.5” drop point EX-01 in G-Mascus to my own collection, but the appeal of the exotic-looking EX-04 is undeniable.